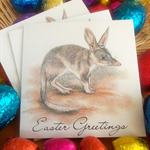 Australian Wildlife art CARDS, CALENDARS, PRINTS & GIFTS. Based in the eastern suburbs of Melbourne and all paper products printed locally on 100% recycled paper. With a strong emphasis on wildlife conservation, I love to try to capture a bit of the personality of the subjects I draw. Each year I give some of the profits of my sales to wildlife conservation and animal protection organisations through memberships or donations.